Challenging games are always interesting to watch and it doesn’t matter what field they are being played on. Be it the stadium or the Indian auto market harder the challenge gets deadlier the game becomes. In the entry level sedan segment of India, Maruti was the sole leader till date. The only ruler that was playing its own game by its own rules. But the scene changes now as another potential player joins the league. It will be interesting to watch as to how Honda claims its share in the segment where the home grown hero was ruling with its full might and strength. We are talking about the compact segment section where Maruti Swift Dzire rules with a minor share of Indigo CS. The Honda Amaze Diesel has challenged the supremacy of the Dzire. Lets find out in a comparison of Honda Amaze VS Maruti Swift Dzire. Maruti has bestowed Swift Dzire with the world known K-series petrol and DDiS diesel engine whose technology and efficiency has been acknowledged throughout the world. The petrol version of the sedan has been presented with a 1.2 liter K-series power mill that generates power worth 87 PS against a peak torque of 114 Nm while the diesel version proudly adorns a 1.3 liter DDiS engine whose power quotient equals to 75 PS coordinating with a maximum torque of 190 Nm. The diesel version of Swift Dzire deliver a mileage of 23.4 KMPL as per ARAI. Honda on the other hand has left no stone unturned to give Honda Amaze the most compatible power train. The petrol trim of this sedan will be powered by a 1.2 Liter i-VTEC engine that rolls out maximum power worth 88 PS while the diesel version has been blessed with a 1.5 liter i-DTEC engine that belts out power worth 100 PS. This super power engine gives the diesel Honda Amaze an efficiency to deliver a mileage of 25.8 KMPL as per ARAI, which makes it the most fuel efficient sedan of India. And that’s the point where the two warriors come neck-to-neck. Isn’t it? Both the sedans have been gifted with five speed automatic transmission gearboxes. Also both come with an automatic transmission option in the petrol models only. Theoretically both seem equal but practically which one will score better that is yet to be seen. 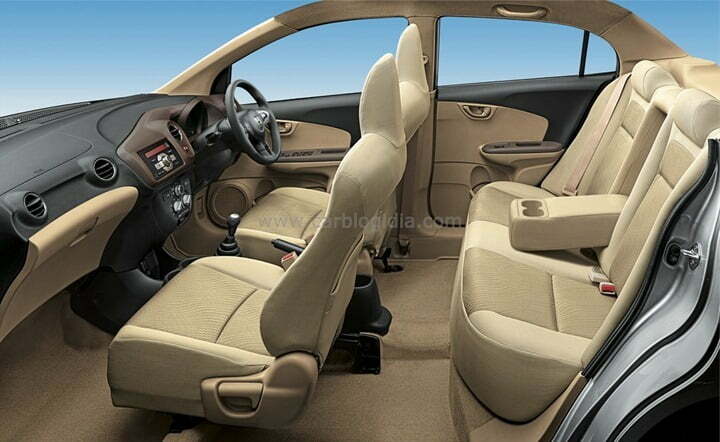 In terms of internal space, Dzire has nothing new to offer. The sedan has almost equal space as is offered by its basic inspiration model Swift hatchback. 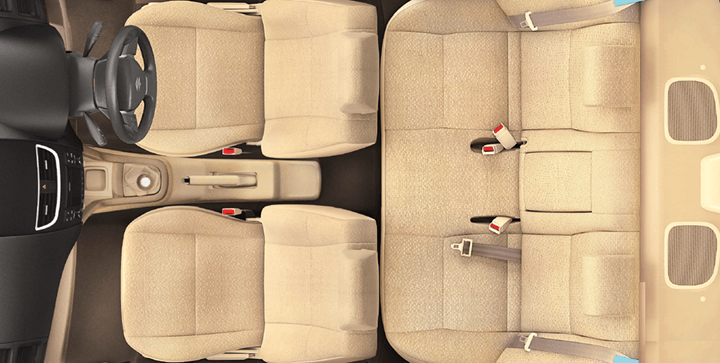 The front seats have comfortable space to offer but it is the rear part that makes movement within a challenge. The boot space is of 315 liters that is enough to accommodate plenty of luggage. Honda Amaze on the other hand has a little more and better to offer considering the cruel limitation of dimensions. The wheelbase of this sedan extends that of Brio by 60 mm. The sedan sets a perfect example of the man maximum and machine minimum philosophy. The boot space offered is 400 liters along with plenty of space at both front and rear seats for head, leg, elbow, shoulder, and hand movement. Seems like this one really caught on Dzire! Pricing of any vehicle is the final ace that decides the winner and loser of the game. And this fits most true in terms of economical price conscious Indian customers. With the recession being so rampant in all segments, it will really be of great interest to see what strategy these two players will apply to win over customers. Swift Dzire at present is being offered in the range of Rs. 4.92 lakhs – Rs.7.50 lakhs. Honda Amaze has been priced between Rs. 4.99 lakhs– Rs. 7.6 lakhs. Detailed price list and video review of Honda Amaze here. Maruti Swift Dzire has been an old and potential player in this segment. The sub four meter luxury sedan has already claimed its share of place in heart of customers with its affordable pricing and heart wining features. It is the only sedan that has managed to trade almost 13, 000 units per month on an average in last one year. With this rate of success and Maruti being synonymous to the name of trust seems impossible that any other brand would ever be able to take over it. Honda on the contrary, has always been known as an expert in catering consumer demands. The Japanese car maker since its entry in India has earned quite a proficiency in reading consumers mind and giving them exactly what and how they want. And in terms of luxury sedans, there has been no brand who could ever compete with Honda’s offering. And the prime example if this is the success of Honda City. No other sedan has been able to stand against this name. Honda Amaze since its launch is being widely anticipated across the nation. The sedan hasn’t looked back since its launch in any part of the world. And being launched in both petrol as well as diesel version is definitely going to be an unbeatable option in its respective segment. Now what more will happen when these two legends will stand face to face that is yet to watch? In terms of design, space, features, engine options and space, Honda seems to have clear advantage and is simply ahead. While on the brand recognition, economy and service network availability, Maruti seems to have an upper hand. But overall, Amaze seems to be a better package compared to Maruti Dzire.